"I take statins, and (Keralex) protects me from the destructive impact statins have on my mental function." "Memory is improving. Looks like I struck an oil well." "I believe my brain feels better after using. I was in a car wreck 9 months ago and have experienced headaches. Discovered I have Chiari and will have surgery so I need brain health." "I bought it to help defog my brain and it started working in just a day or two." "I no longer feel "brain fog" and my mild-to-moderate depression has lifted." "I recently decided to try Keralex after hearing about the brain, cognitive and other support it provided. After taking Keralex for a few weeks, I realized I hadn’t had a severe migraine during that time. I’m 60 years old and have had migraines for over 58 years, as a result of damage from a severe case of chickenpox as a baby. I’ve been through all the usual migraine medications, including meds for blood pressure and seizures and even Botox injections in my head, neck and shoulders. Some helped for a short time, but then lost their effectiveness. Plus, I could barely stay awake or do any of the things I enjoyed, and I still had the migraines. Over the years I learned that taking large doses of Omega-3 helped. But, I was still getting about two severe migraines a month, each lasting four to five days. Spring and Fall were the worst, because weather changes are one of my migraine triggers. I was disappointed that I didn’t see anything on the Medix Select site about any supplements for migraines. But, after starting on the Keralex, I realized the higher amount of DHA and other ingredients were apparently what I needed. When I ran out of Keralex for about a week I noticed the migraines were starting to come back, but were better again after I received my next order of Keralex. I don’t know if this will work for everyone with migraines. But, I think it’s important to let people know they should at least try it and see if Keralex works for them. I’ve been taking Keralex for a little over a month and am thrilled with the results. I will continue to take Keralex and let you know if my results continue. Thank you, C.D." "I feel my thinking has been clearer since I began using. I used the first "brain" product which was developed by Dr. Blaylock. I wish you would develop this product as a "time release" product. I cannot get my husband to "remember" to take it. We both like the product, but it is difficult to take 4 X's per day." "My thinking process has increased in that when I do a task my brain says you also need to this, i.e., doing laundry I have forgotten to gather my support stockings but now it is done. Other tasks are similar. One area is when in conversation there is a gap before I recall a name or a word that I want to say. I'm just about to finish my second bottle, so the 90 day bottle may help in this area." "It's a bit early in the process, but I am satisfied, very satisfied, in fact, so far!" "I am healthy 59 year old eating good nutrition and I'm getting exercise at the gym. However I noticed that before I took Keralex I was starting to get some senior moments like grasping occasionally at a few words and trying to remember things that I should have easily remembered. And then I started taking care lyrics and I'm not noticing any senior moments forgetting things so thank you very much for the great nutrition that Keralex contains for the brain." "In the early 2000's I was in a serious car accident and suffered a head trauma. Throughout the past 14 years I have noticed slight continuing deminuation in the activities of my mind. 3 years ago I began to have difficulty in pulling up the correct word I wanted to use an example is, I would want to use the word feline, but had to use the word cat. Also so little details of my everyday life were not forgotten but not in the front of my mind. My doctors offered no supplements to address these problems/concerns. 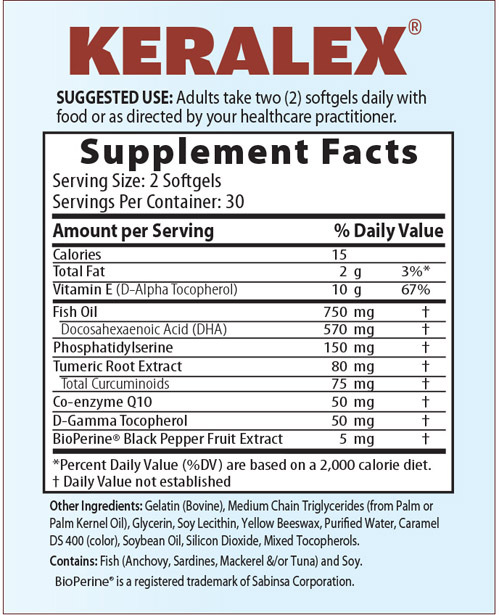 Upon adding Keralex to my diet, my memory improved dramatically and I have the ability to resource my vocabulary better. This brain enhancements have made a significant improvement to my life."